Use a dust shoe / dust hood on your High-Z or T-Rex quality cnc machine and stay safe when milling / routing materials that generate dust. 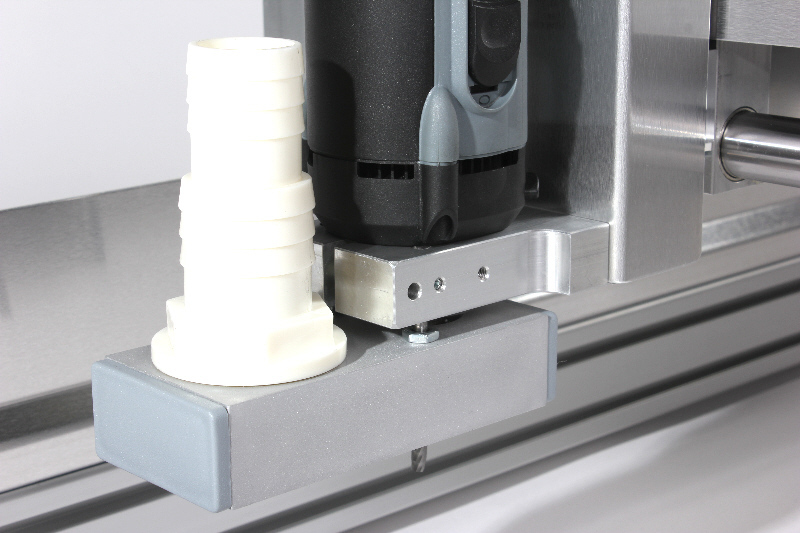 This dust collection adapter is designed for all Kress and Suhner spindles, but it will also work with any spindle that can be secured with a Ø 43 mm spindle mount. It is easily installed in seconds and can be adjusted up and down within a range of about 12 mm . Fits 32.5 and 38.5 mm vacuum hoses, and adapters are readily available. A standard ShopVac is sufficient as a vacuum source. Make sure to use this accessory, or make one yourself. Not only does it make cleanup and maintenance easier, but more importantly, it removes the fine dust that would otherwise get in your body.